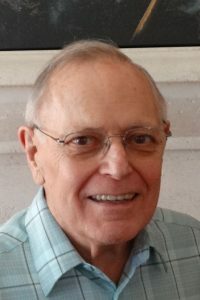 Ronald John Theriot, devoted Husband, Father, Grandfather, Uncle, and friend to all, passed away on Wednesday, March 20, 2019, at his home in League City at the age of 80. He was born on March 18, 1939, in New Orleans, Louisiana to Evest and Stella Theriot. Although a man of many trades, he spent almost his entire career as a Quality Engineer working with the NASA Space Program. Ron was kind, generous, and made everyone laugh with his wonderful sense of humor. He was strong in his Catholic faith and sacrificially loved his family. Ron was preceded in death by his parents and daughter Leigh Cherie Theriot. He is survived by his loving wife Donna, children Ronda Mayeux and husband Craig, their child Carson, Duane Theriot, Andrea Owens and husband Jeff, their children Ella and Easton, niece and nephew Kevin Toler and wife Leslie, Kristen Hernandez and husband Bradley, and many other loving family and friends. The Family will receive friends on Friday, March 22, 2019, from 6-8:00pm at Crowder Funeral Home, 1645 East Main Street, League City, Texas 77573. Come hear shared memories at a 7:00pm Vigil followed by Rosary. A Funeral Mass will follow on Saturday at 10:00am at St. Mary Catholic Church, 1612 East Walker, League City, Texas 77573 with Father Howard Drabek presiding. Interment will take place at Forest Park East Cemetery in Webster, Texas. Memorial Donations may be sent to Knights of Columbus Council 9310, C/O St. Mary Catholic Church, 1612 East Walker, League City, Texas 77573. We are so sad to hear of Ron passing and the feeling of loss your family is feeling. We are comforted that he is with the Lord. We will remember his easy and gentle spirit and his ever present smile. Duane, we are so sorry to hear about the loss of your father. Prayers for you and your family during this time. We are so blessed to have known Ron here in Wild Country and so sad he has gone from his family. But we take great comfort in knowing he is with the Lord and in perfect peace right now. God bless Donna and the children and know we treasure our friendship. I’m very sorry to hear this news. My sincere condolences to Duane and the family. So sorry for your loss. Praying for you and all the family. My condolences to the Theriot family. Eternal rest grant unto Ron, oh Lord. I am so sorry for your loss. Ron was a great, generous man. Our are in my thoughts and prayers. So sorry to hear of Ron’s passing. We made wonderful memories of our families getting together and enjoying each other. My sincerest condolences to Donna, Rhonda, Andrea and Duane . I am very sorry to hear of Ron’s passing. I did not know this or I would have gone to the Visitation and to his funeral. My deepest sympathy to his family.